Toyota says that their new Yaris sees significant improvements to the outgoing model’s design, performance, and styling. It is available in five grade options - Terra, Aura, Luna, Luna Sport, and Sol - and uniquely, for the B segment, four of them are available in hybrid. In fact, hybrid currently accounts for more than 35 per cent of Yaris sales in Ireland. The new Yaris makes a stronger style statement, displaying new front and rear designs that give the car a stronger harmony of design and project a more active and dynamic look. The appearance is also more refined, with detailing in the bodywork and the cabin and new colour choices that enhance the model’s already high levels of perceived quality. The focus for changes to the Yaris’s interior was to keep the look and ambience of the cabin feeling fresh and modern. New upholsteries, colours, and trim details and upgraded instrumentation and controls have been introduced, which Toyota claims will ensure excellent ergonomics and human-machine interface performance. The Yaris Hybrid remains a unique proposition in its segment, with best-in-class CO2 emissions. Toyota says the Yaris Hybrid noise and vibration levels have been significantly reduced with new engine mounts, roll restrictor, front driveshaft, and sub frame. In addition, Toyota says that new engine mounts, shock absorber adjustments, and retuned electric power steering improve Yaris Hybrid’s ride comfort and steering accuracy. 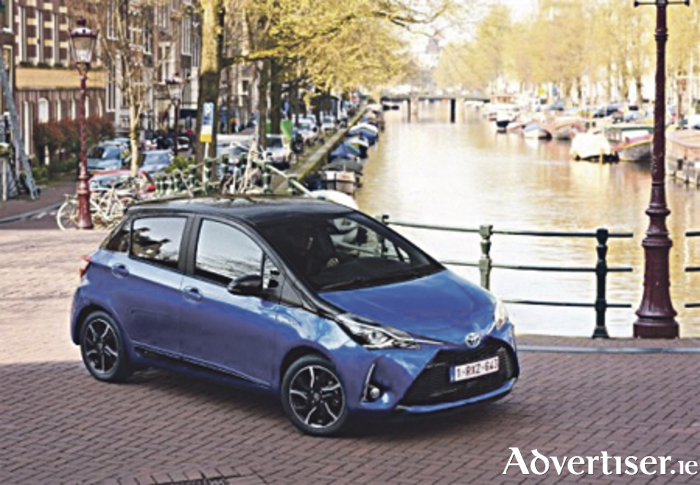 The new Yaris brings big-car safety into a small, city-sized package with the adoption of ‘Toyota Safety Sense’ as standard across the range, including a pre-collision system with autonomous emergency braking, automatic high beam, and lane departure alert. Road sign assist is also available as standard on all but the Luna grade. Steve Tormey, chief executive of Toyota Ireland, said: “With 14 per cent market share in the B segment we believe the arrival of the new Yaris to our showrooms around Ireland in time for 172 sales will quickly see it appeal to both current and new customers. Page generated in 0.1114 seconds.